The New York Standards Quartet (aka the NYSQ) formed around 2006, its members sharing a love of standards played with a contemporary edge. This, the band's fourth album, is called The New Straight Ahead. As band name and album title suggest, this is a collection of straight-ahead standards, given new arrangements and "redesigns" by the quartet. Re-inventing the standards can be fraught with difficultiesthese tunes are, after all, much loved in their original or classic incarnations. Changing tempos or altering time signatures can also impact on the emotional qualities of a tune. 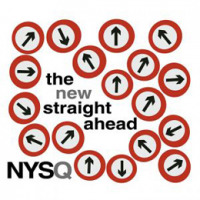 The NYSQ is inventive enough to give these familiar compositions a few new angles, but it's also intelligent enough to know how far to push things. The arrangements on The New Straight Ahead (each credited to the quartet as a whole) offer some new perspectives on some very well-known tunes, but never get so radical as to render them unrecognisable. Herbie Hancock's "The Maze" opens with Daiki Yasukagawa's powerful unaccompanied bass solo before settling into a more recognisable version of the tune. Tim Armacost's soprano sax is featured on "It Don't Mean A Thing," the quartet finding that swing to be a fairly gentle shuffle. Courtesy of Gene Jackson's hard hitting drums and Yaukagawa's bass groove "Autumn Leaves" gets down and funkyprobably the most extreme re-interpretation on the album. Armacost moves to tenor sax for Leigh Harline's "When You Wish Upon A Star." David Berkman's piano sets the mood, crafting a version that (for those who don't immediately see images of an irritating little cricket) emphasises the tune's romance and sense of longing. Jimmy Van Heusen's "Polkadots And Moonbeams" makes two appearances: as "Intro (Polkadots)" and "Outro (and Moonbeams)." Each lasts less than a minute: laid-back, almost sleepy, tenor/piano duets. One quibble with presentationthere are no composer credits on the sleeve. It seems only polite to acknowledge the creators of these tunes, however well-known they may be to fans of the music. After all, without the old straight-ahead there would be no The New Straight Aheadand that would be a pity.